Consider the news source for the excerpt of this article and it can be easily brushed off as another trash tabloid headline grabber but stories of the Florida GatorMan have a chilling ring of authenticity. Bipedal reptoids were first introduced to American movie-goers in the 1950’s with the release of Creature From the Black Lagoon and its sequel, Revenge of the Creature Then in the 1980’s Christopher Davis’ terrifying encounter with ‘LizardMan’ in Scape Ore Swamp of Lee County, South Carolina elevated the bipedal reptoid to celebrity status in the cryptozoological world. The Everglades Gatorman is probably Florida’s oldest cryptozoological oddity dating back to the 1840’s when English and Scottish settlers were making their way through Florida swamplands. 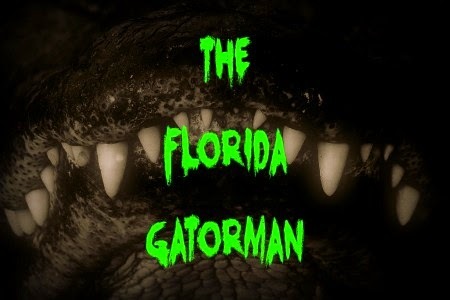 According to Greg Jenkins – in his Chronicles of the Strange and Uncanny in Florida – the legend of the Florida GatorMan has been told by native Indian tribes for hundreds of years. But now the Florida GatorMan is back in the limelight – but this time he is living in the St. John’s River on Florida’s East Coast. (Maybe he is trying to give ‘Pinky’ a run-for-his-money?) In her book, American Monsters: A History of Monster Lore, Legends, and Sightings in America Linda Godfrey included an eyewitness account of the Florida GatorMan by a college student living on the St. John’s River who observed the creature and described how it went from crawling on all fours on the sand to standing upright on its massive hind legs by doing what looked like a ‘push up’ with its front limbs and claws to assume the upright position. The eyewitness’ account also included a scary experience as the GatorMan peeked through the porthole of a sailboat at him and his girlfriend! Perhaps the earliest recorded sighting of a ‘fish man’ or a ‘gill man’ comes from the files of Loren Coleman back in the 1930’s when a fisherman on the Saginaw River saw a ‘gill man’ emerge from the water, lean against a tree and return to the river. The poor man had a breakdown! In my article, Monsters Are Real on this website I described how the Nephilim were involved in genetic interference – mixing DNA from humans and animals to create monstrosities. Genetic interference – you know it as ‘cloning’ - is an abomination to God so He destroyed these creatures in the Great Flood. After the earth became repopulated with humans and animals Satan once again had a go at playing Jurassic Park and created another menagerie of monsters. Because God promised to never again destroy the earth by water, these creatures are still with us today. Although this is a Creationist theory – supported by Patrick Heron in his book, Nephilim and the Pyramid of the Apocalypse – it is the most plausible one in describing monsters.